WARNING: Some of the images in the video may be disturbing to watch. ABC News has obtained new video of a young boy who crawled into a gorilla enclosure at the Cincinnati Zoo. We warn you - some of the images in the video may be disturbing to watch. ABC News has obtained new video of that may be disturbing to watch for some viewers. The video captures a toddler's screams the moment he comes face-to-face with the giant gorilla. Zoo officials say the 4-year-old, now recovering at a hospital, crawled into the Gorilla World Exhibit. 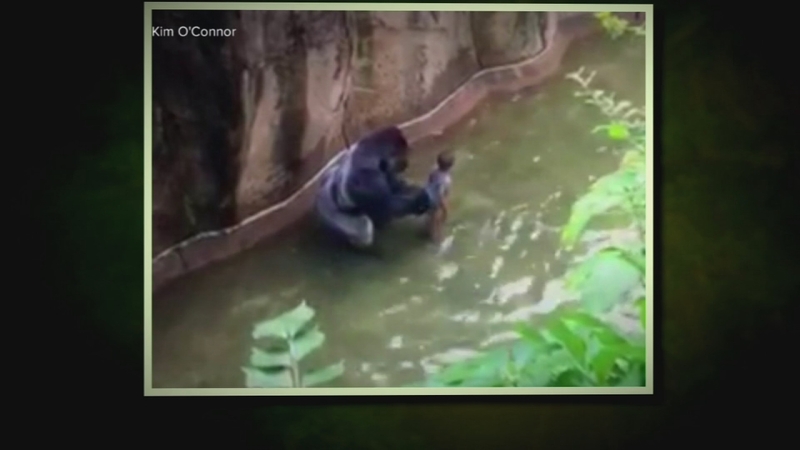 The boy's mother can be heard calling to him as the gorilla crouched over the boy. Then the 400-pound primates moved away from the camera, dragging the child along. The gorilla, a 17-year-old silverback named Harambe, was shot and killed by zookeepers to rescue the boy. Zoo officials are now looking into just how the little boy made it into the enclosure. Good Morning America spoke to animal trainer Dave Salmoni about the incident. Animal trainer Dave Salmoni speaks on the gorilla incident at the Cincinnati Zoo.